Running is a wonderfully efficient way to improve your health, except when it produces chronic injuries. The best way to safely enjoy a running program is to gradually build the intensity of your workouts. Typically, a running coach or trainer will recommend increasing distances no more than 10 percent a week. If you have an underlying health condition or are new to exercise, make your first step a consultation with your physician. If you have a history of orthopedic injury or joint pain, seek the advice of an orthopedic surgeon. Hip Bursitis – This is an overuse injury caused by friction between the iliotibial tendon band and the hip bone. This large tendon travels over the bony prominence on the outside of the hip, goes all the way down to the leg and attaches just below the outer side of the knee. When we run, this band rubs back and forth over the outer hip bone; over time the friction creates inflammation. Our bodies have natural “cushions” called “bursa” that are designed to reduce this friction, but if they have not had time to adapt they can swell and hurt, causing pain in the front of the knee. This condition is common among runners. Kneecap Pain and Patella Tendonitis – This results in pain in front of the knee and is common among runners. The quadriceps muscle in the front of the thigh powers our ability to straighten the knee. It works by using the kneecap or “patella” for leverage across the knee. This generates pressure and can cause the kneecap to become sore. The quadriceps muscle tapers to become a tendon that attaches to the kneecap and then to the shin bone (tibia) via the patella tendon. When strained, the quadriceps and patella tendons can also develop micro tears and become inflamed. Treatment includes rest, anti-inflammatories, strengthening exercises, cross training and progressing back to running while avoiding hills. Shin Splints – This can occur on one or both shins, but most commonly on the dominant leg. This condition is caused by inflammation where the Soleus muscle in the calf attaches to the tibia. As the muscle helps runners with “pushing off,” it pulls on the attachment site, which may become inflamed and swollen. This pain usually hurts only when running. Treatment for this overuse is rest and cross training. Achilles Tendonitis – The strong Achilles tendon is prone to inflammation when starting a running program. Our calf muscle tapers off to become the Achilles tendon that inserts into the heel and powers the push-off of the running stride. Running uphill demands more stretch from the calf, forcing it to work harder. This can lead to micro tears of the small Achilles fibers. Micro tears do not become full tendon ruptures, but cause inflammation and swelling as the body tries to repair and regenerate the area. The usual treatment is rest, stretching, strengthening, cross-training and as the pain dissipates, a gradual return to running with limited hills. Plantar Fasciitis – The most common early symptom of this comes with morning’s first step. The plantar fascia is a tight band of tissue that supports the foot arch. It attaches to the heel and traverses across the sole, attaching broadly across the end of the foot. When we run, the plantar fascia can become overstressed at the smaller attachment on the heel, especially in individuals with tight calf muscles. Initially, inflammation starts after the run and hurts upon standing after a period of inactivity. When the foot and ankle bend to stand flat, the fascia stretches and hurts. The best treatment is to recognize it early and rest. Most of us can enjoy running without ever suffering from these common maladies. My best advice is to cross train and to recognize symptoms early and not ignore the pain. If you pay attention to symptoms, you can help avoid painful injuries and stay active. OrthoConnecticut is the region’s premier, multi-specialty orthopedic and pain management practice. Thirty-one fellowship- trained, board-certified physicians offer patient care at nine offices in Danbury, Darien, New Canaan, New Milford, Norwalk, Ridgefield, Sharon, Southbury and Westport. The practice’s urgent care service, OrthoCare Express, is open 7 days a week for emergencies and is available in Danbury, Darien, Norwalk and Westport. To make an appointment with Dr Henshaw, or to learn more about OrthoCare Express, please visit http://www.myorthoct.com/, or call 1.833.ORTHOCT (1.833.678.4628). This entry was posted in Achilles Tendonitis, Hip Bursitis, Kneecap pain, Plantar Fasciitis, Running, Shin Splints, Sports Medicine and tagged M.D., OrthoConnecticut, Ross Henshaw, Running Right to Avoid Common Injuries, Sports Medicine on October 26, 2018 by bbrand. 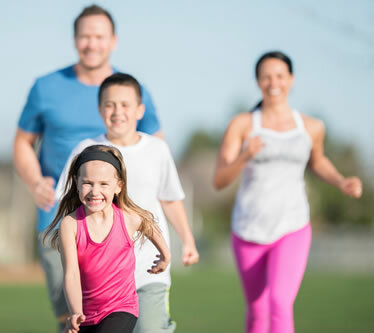 DANBURY, CT – As any runner will tell you, this simple sport is one of the most rewarding and convenient exercise activities. It’s a wonderfully efficient way to improve your health, except when it produces chronic, nagging injuries. So what’s the best way to safely enjoy a running program? Start smart, with a progressive training schedule that gradually builds the intensity and duration of your workouts. Typically, a running coach or trainer will recommend increasing distances no more than 10% a week. If you have never been a runner, seek advice from friends, trainers or your local athletic store. There are also great resources online and in print. But if you have an underlying health condition or are new to exercise, make your first step a consultation with your physician to be sure it’s OK to start running. Orthopedically, running is a safe exercise for most people but there are exceptions, even among athletes. So if you have a history of orthopedic injury or joint pains, particularly those involving the legs or spine, seek the advice of an orthopedic surgeon. The longer the duration and hillier the terrain, the more our joints are cycling and the more our tendons and ligaments are pulling and rubbing around our joints. When we start an endurance sport like running and build up too quickly, the abrupt increase in joint motion can lead to ‘overuse’ injuries. Kneecap pain and Patella Tendonitis – Often grouped as ‘anterior knee pain’, this refers to pain in the front of the knee and is common among runners. The quadriceps muscle in the front of the thigh powers our ability to straighten the knee. It works by using the kneecap or ‘patella’ for leverage across the knee. This generates pressure and can cause the kneecap to become sore. It’s especially evident when people walk down stairs or inclines and is precipitated by excessive downhill running. The quadriceps muscle tapers to become a tendon that attaches to the kneecap and then to the shin bone (tibia) via the patella tendon. When strained, the quadriceps and patella tendons can also develop micro tears and become inflamed. Treatment includes rest, anti-inflammatories, strengthening exercises, cross training and progressing back to running while avoiding hills. Shin Splints – Shin splints, or ‘posteromedial tibial stress syndrome’, can occur on one or both shins, but most commonly on the dominant leg depending on your stride. Pain originates at the lower third of the inner part of the shin just behind the bone. The pain is usually discrete and easily reproduced by pressing on the trigger point. This condition is caused by inflammation where the Soleus muscle in the calf attaches to the tibia. As the muscle helps runners with ‘pushing off’ it pulls on the attachment site, which may become inflamed and swollen. This pain usually hurts only when running, early or later in a run. Some people try to run through the pain, which worsens it so that even walking becomes painful. Treatment for this overuse is rest and cross training. Some people may be predisposed to shin splints because of running style or leg, ankle or foot alignment. Achilles Tendonitis – The strong Achilles tendon is prone to inflammation when starting a running program, particularly on hilly terrain. Our calf muscle tapers off to become the Achilles tendon that inserts into the heel and powers the push-off of the running stride. Running uphill demands more stretch from the calf, forcing it to work harder. This can lead to micro tears of the small Achilles fibers. Micro tears do not become full tendon ruptures, but cause inflammation and swelling as the body tries to repair and regenerate the area. The usual treatment for this pain is rest, stretching, strengthening, cross-training and as the pain dissipates, a gradual return to running with limited hills. Plantar Fasciitis – Dreaded heal pain! Its most common early symptom comes not with running, but with the morning’s first step. The plantar fascia is a tight band of tissue that supports the foot arch. It attaches to the heel and traverses across the sole, attaching broadly across the end of the foot. When we run the plantar fascia can become overstressed at the smaller attachment on the heel, especially in individuals with tight calf muscles. Initially, inflammation starts after the run and hurts upon standing after a period of inactivity. When the foot and ankle bend to stand flat, the fascia stretches and hurts. Best treatment is to recognize it early and rest, cross train and take an anti-inflammatory. More severe cases may require calf stretching, night splints that keep the plantar fascia stretched, and heel pads. While it sounds like a lot can go wrong, most of us can enjoy running without ever suffering from these common maladies. As a sports medicine specialist, my best advice is to recognize symptoms early and not ignore the pain. Early recognition and treatment generally lead to a quicker recovery. I also recommend cross training. Even if you prefer running as your primary aerobic exercise, you’ll benefit by incorporating other forms of conditioning such as biking, elliptical or swimming into your routine. If you pay attention to symptoms and mix it up, you can help avoid painful injuries due to repetitive overuse of the joints … and stay active. Should an unexpected injury occur, runners in the region can access the orthopedic urgent care service offered at Danbury Orthopedics. OrthoCare Express, the walk-in, orthopedic emergency treatment center, is open 7 days a week in the heart of downtown Danbury, CT at 226 White Street. The Center is staffed by fellowship trained orthopedic surgeons and highly trained Physician Assistants, and is open weekdays from 8 am – 8 pm, and on weekends from 10 am – 3 pm. No appointment is necessary and no referral is required. Visit orthocareexpress.com or call 203.702.6675 for more information. This entry was posted in Achilles Tendonitis, Conditions, General, Hip Bursitis, Kneecap pain, Patella Tendonitis, Plantar Fasciitis, Running, Shin Splints, Sports Medicine, Torn ACL and tagged Achilles Tendonitis, Danbury Orthopedics, Dr. Ross Henshaw, Hip Bursitis, Kneecap pain and Patella Tendonitis, OrthoCare Express, OrthoConnecticut, Plantar Fasciitis, Running Right, Shin Splints on May 1, 2016 by bbrand.